Potatoes litter the road and a tractor-trailer is on fire after a crash July 3 near Eden. One person died in the crash. A Twin Falls man died Aug. 1 north of Jackpot, Nev., when his car crossed into oncoming traffic and hit a tractor-trailer head on. Police tape blocks off access to Shake Out on Sept. 5, 2018, in Twin Falls. Shake Out was closed after a car crashed into it. The driver of the car, 26-year-old Brandon Worring of Twin Falls, died on the scene. TWIN FALLS — Distracted drivers. Angry drivers. Impaired drivers. These are the top three behaviors that cause fatal crashes in Idaho during the “100 Deadliest Days” — the time between Memorial Day and Labor Day when more traffic deaths happen than any other time of year. Statewide, Idaho had an estimated 102 fatal crashes during that time frame — 15 of those were in in south-central Idaho, resulting in 16 deaths and 15 injuries, according to preliminary numbers. Many of the victims’ families are still waiting for closure as agencies hold off on pressing charges until toxicology reports come back for some of the drivers involved. Most charges won’t be filed until prosecutors have all the information, said Lt. Robert Rausch, patrol commander for Idaho State Police District 4. Such is the case with the first of the region’s fatal crashes, which took place June 3 on Interstate 84. ISP’s report said a wrong-way driver caused the deaths of two people, while three others were injured, and it appears that alcohol was a factor in the crash. Police are fielding lots of calls from the public about the crash, but don’t yet have all the answers. “We do not still have all of the information back to make an appropriate charge,” Rausch said. In a typical year, impaired driving is a factor in about 40 percent of fatal crashes throughout the state. This year, it’s been a factor in about a quarter of fatal crashes. A 20-mile-long construction zone on I-84 was the scene of 32 of the 144 crashes ISP responded to in May, June and July. But only one of these construction-zone crashes was fatal. “The most important thing for people to remember when they’re going through a construction zone is that traffic patterns change,” said Jessica Williams, spokeswoman for the Idaho Transportation Department. Drivers should give themselves plenty of reaction time, she said. Rausch said this year there were a lot of sudden stops, merges or slowing down that resulted in rear-end collisions. “The first driver would be kind of caught by surprise, and the other drivers would be caught by surprise,” he said. The speed limit was initially 70 mph throughout the construction zone. It’s generally recommended to slow traffic no more than 10 mph, Rausch said, but this zone was an exception due to crashes. So in July, ITD lowered the speed limit to 65 mph — or less, in some areas. The length of the work area was not unheard of, but it was also something that frustrated a lot of people, he said. This can lead to aggressive behaviors such as speeding, tailgating or sudden merges. ITD took all the right steps to get speeds down and finish portions of the construction faster, he said. Local law enforcement agencies have released the preliminary collision reports for most of the crashes that happened in ISP District 4. These reports are subject to change as police get more information. In cases where charges are pending, Rausch says it’s not uncommon to wait a year before charges are filed. It was shortly after 7 p.m. on a Sunday when Brian Trappen, 36, of Twin Falls drove his Ford F-250 pickup the wrong way on I-84 east of Jerome. Trappen was driving east in the westbound lanes when a Dodge Caravan driven by a teenager swerved to avoid the truck. The Dodge rolled into the median and landed in the eastbound lanes, setting off a chain reaction, according to the Idaho State Police crash report. The six-vehicle crash resulted in the deaths of the teenage driver and his mother, Maricruz Lenhart, 51, of Middleton. Injured were Trappen; Sharon Taki-Bishop, 61, of New Castle, Wash.; and Francisco Delatorre, 48, of Middleton. According to the report, Trappen had a blood alcohol content of .073. Charges are pending. Dionicio Verdugo Ibarra, whose age and address are unknown, was driving east on a Saturday evening on 300 North in Minidoka County. Near 500 East, his GMC Sierra ran off the right side of the road. The driver pulled the vehicle back, running it off the left side of the road, then lost control. The GMC Sierra rolled and the driver was thrown from the vehicle onto the road. According to the crash report taken by Minidoka County Sheriff’s Office, drugs and alcohol were involved but blood test results were not known. This fatal crash occurred south of I-84 on a Monday morning. Tony Dryden, 57, of Rupert was driving west on 1010 South in a Chevrolet Malibu. According to the ISP crash report, Dryden didn’t stop for a semi that was waiting to turn left into a gravel lot, east of Eden Road. The vehicle rear-ended one of the semi’s trailers. Dryden, who was not wearing a seat belt, died at the scene. Frankie Bennett Jr., 56, of Burley was driving his black Kawasaki motorcycle on a Saturday night on Idaho 24 east of Shoshone. While coming around a curve, Bennett drove onto the shoulder and lost control of the motorcycle. When the bike toppled, he was thrown from the seat and hit a street sign. Bennett died of his injuries at the scene. His blood alcohol content tested at .171, according to ISP’s collision report. Westbound lanes were being diverted into an eastbound lane on I-84 that Tuesday morning due to construction. A westbound semi hauling potatoes suddenly swerved into oncoming traffic. David John Wetmore, 57, of Irrigon, Ore., was driving the semi, which struck another semi driven by Corey McCaslin, 39, of Port Washington, Ohio. Both trailers caught fire after the head-on crash, and McCaslin died at the scene. Wetmore was injured. The ISP trooper’s crash reported said alcohol and drugs were involved, but test results are unknown. Charges are pending. Larae W. Crane, 85, of Burley was driving a Ford Focus south on 3300 East, about 2 miles east of Twin Falls, when she didn’t stop for a stop sign. Two other vehicles were involved in the resulting crash, investigated by the Twin Falls County Sheriff’s Office. An ambulance took Crane and a passenger in her vehicle, Danford L. Crane, 88, of Burley, to St. Luke’s Magic Valley Regional Medical Center with injuries. Larae Crane later died at Portneuf Medical Center in Pocatello. Rick T. Heath, 52, of Kimberly, was in a Honda Accord headed west on 4000 North. He was also taken by ambulance to St. Luke’s Magic Valley Regional Hospital. The driver of the other vehicle was not injured. It was early morning on the Fourth of July when Laura L. Smith, 53, of Kempner, Texas, was driving east in a Dodge pickup pulling a Cadillac Seville on a U-Haul trailer. She drove off the right shoulder. When the vehicle came back onto the roadway, she lost control, driving through the median and colliding with a westbound FedEx tractor-trailer. Richard D. Johnson, 81, of Deer Park, Wash., was a passenger in Smith’s front seat and was flown to Portneuf Medical Center, where he later died. He was not wearing a seat belt. Also injured were Smith and another passenger, 59-year-old Robert P. Smith of Kempner. A Jeep Liberty was struck by the Cadillac when it fell off the trailer, and driver Cody Cartisser, 18, of Jerome was also injured. According to the crash report, charges are pending for Laura Smith. Karen D. Guymon, 46, of Twin Falls was driving late on the evening of July 14. She was westbound on Second Avenue East when she didn’t see two pedestrians in the roadway. Aikoma Nensy, 38, of Twin Falls was sitting in the middle of the far right lane on Second Avenue East. JonJon Anakeneto, 38, of Twin Falls was standing beside her. Both were struck by Guymon’s vehicle. Nensy died at the scene. According to the report, she had drugs and alcohol in her system. Anakeneto had alcohol in his system and was taken to the hospital with injuries. Guymon did not have drugs or alcohol in her system and was not cited. David J. Cowger, 64, of Filer crashed his ATV and was found in the middle of the road with significant skull fractures. The Twin Falls County Sheriff’s Office believed he struck an antelope and later died from the resulting injuries from the rollover. Troy L. Degraff, 42, of Folsom, Calif., was eastbound on I-84 that Friday evening when he rear-ended a Jeep that was stopped due to congestion. That vehicle was pushed into a semi, and both overturned onto the roadway. The Jeep in the middle caught fire, and its driver, Woody D. Clifford, 54, of Idaho Falls, died at the scene. Degraff was also injured and taken to Cassia Regional Medical Center in Burley. The initial crash report filed by ISP says he was distracted but was not under the influence of drugs or alcohol. He was not cited. 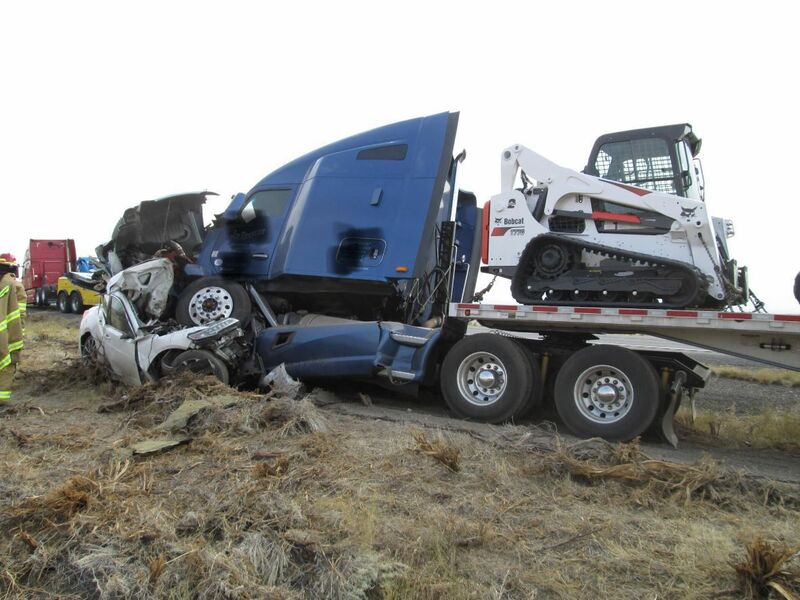 William E. Selelyo, 72, of Twin Falls was northbound that Wednesday afternoon on U.S. 93, north of Jackpot, Nev. His car crossed into the southbound lanes and struck a tractor-trailer head-on. Selelyo died at the scene. According to the report by ISP, it’s unknown whether drugs or alcohol were involved. The driver of the semitrailer, Michael E. Wilkens, 54, of Bismarck, N.D., was taken by ambulance to St. Luke’s Magic Valley Regional Medical Center. Debbie Turrentine, 52, of Jerome was eastbound on East 200 North on a Friday afternoon when she failed to yield at a stop sign. As her Dodge Caliber crossed U.S. 93, it was struck by a GMC Acadia driven by Cristina Villa-Guzman, 25, of Shoshone. Turrentine died at the scene. Villa-Guzman was not wearing a seat belt and was flown to Portneuf Medical Center with injuries. On a Sunday evening, Vincent D. Gauthier, 43, of Twin Falls was driving his motorcycle on 900 South, east of Hazelton. He went off the roadway on a curve and was flung from the motorcycle into a lateral ditch. Gauthier was taken to the Twin Falls hospital, then flown to St. Alphonsus Regional Medical Center in Boise, where he died from his injuries. Drugs and alcohol were not involved, according to the crash report from ISP. The Blaine County Sheriff’s Office would not release the collision report but issued a statement shortly after the crash. According to the statement, Kaitlyn Graefe, 20, of Shoshone was driving south near the Timmerman Rest Area when her car crossed the centerline and hit another car head-on. Georgina Ubence, 37, of Bellevue was in the other vehicle and died from injuries at the scene. Javier Ubence, 45, also of Bellevue, was taken to St. Luke’s Wood River Medical Center. Graefe was flown to Portneuf Medical Center. The crash is still being investigated. ISP did not have a crash report available but issued a press release after the incident. Brandon Worring, 26, of Twin Falls was driving a Subaru Impreza on a Sunday afternoon before Labor Day. He ran a red light at the intersection of Second Avenue South and Blue Lakes Boulevard, striking a pickup driven by Ricky Muse, 44, of Twin Falls. Worring lost control of the Subaru and went into a spin, hitting the Shake Out restaurant on Kimberly Road. In a police report, witnesses said Worring was speeding. He died from his injuries. TWIN FALLS — A Kimberly man died Wednesday morning in a two-vehicle crash in Twin Falls County.